A delightfully funny collection of essays by the Indian-American actor, Kunal Nayyar, who plays the loveable, sincere yet incurably dorky character Raj in The Big Bang Theory. 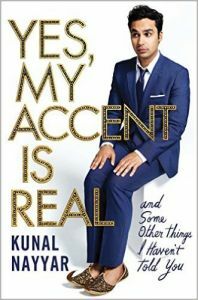 In this revealing book, Kunal Nayyar traces his journey from a nervous little boy in New Dehli who mistakes an awkward first kiss for a sacred commitment, gets nosebleeds chugging Coca-Cola to impress the other students at his all-boys school to the confident guy on the set of one of television's most-watched shows who one day eve gets to kiss the woman of his childhood dreams: Winnie Cooper from The Wonder Years. Throughout, Kunal introduces us to the people who helped him grow, chief among them his slick moustachioed father. From his father, Kunal learned the most important lessons of life: treat a beggar as you would a king. There are two sides to every story. A smile goes a long way. And, when in doubt, use a spreadsheet. Full of heart, but never taking itself too seriously, this is a coming-of-age story about a young man trying to find his place in between cultures, growing into himself as a person and a performer, and of the many embarrassing incidents that somehow miraculously prepared him to land the role that would make his career. Kunal Nayyar's life, both onscreen and off, can be properly summed up in two words: lovable underdog. Luckily for readers, YES, MY ACCENT IS REAL: AND SOME OTHER THINGS I HAVEN'T TOLD YOU is a much longer book. Nayyar's literary debut traverses the globe without following a map, by combining autobiographical essays with cocktail napkin scribbles, alphabetized rundowns, and amusing interstitial non sequiturs. The resulting book is refreshingly frank, and offers both homage to Nayyar's New Delhi childhood and a wry nod to the listicles and first-person storytelling that populate much of the modern Internet landscape. YES, MY ACCENT IS REAL unfurls as an intercontinental journey replete with nostalgia by way of familiar cultural references and lighthearted musings on the origins of Indian holidays and traditions. Chapters romp through standard-issue coming-of-age tropes in a fashion that is anything but standard. Strange juxtapositions of the utterly embarrassing and the ultra-smooth abound--for instance, Nayyar grabs your heart in the book's first pages by detailing the defining occasion of his very first kiss. He deftly muddled through the occasion, with only Kevin and Winnie from TV's The Wonder Years as inspiration, only to be paired with the one and only Danica McKellar (a.k.a. Winnie Cooper herself) in a Big Bang Theory kissing scene years later. After bluffing his way into his first "real job" writing a manual for computer software, he spent his shifts masquerading as a tennis star in chatrooms and got a promotion anyway. He found himself auditioning for plays as a college business administration major at the University of Portland--not because he fancied himself a star or envisioned a luxurious future in the biz, but because he saw it as a way to make friends and get girls. Nayyar illustrates poignant relationships in his uniquely droll style, tempered by tenderness and respect. We meet his French expat college roommate, Diaby, a 6' 8", 250-pound power forward who defines the term "gentle giant" and lends Nayyar an assist with both losing his virginity and nearly becoming the next Mark Zuckerberg, among other more typical collegiate exploits. Nayyar expertly recounts some of his father's advice--including "Use a spreadsheet" ("Dad was an accountant, so I knew how to use Excel before I knew how to unhook a bra") and "Treat a king and a beggar the same" ("This says it all"). When he first meets his first true love, Sarah, she's wearing intoxicating Egyptian Musk perfume, a smell that haunts him to this day. She also makes him lick her eyeball, and then introduces him to Radiohead--all in the same night. Throughout YES, MY ACCENT IS REAL, Nayyar's quirkiness and self-deprecation imbue even the most commonplace scenarios with levity and intrigue. We learn that Nayyar's sport isn't cricket or track, but badminton--and that a birdie is technically named a shuttlecock. We come to understand that the holiday tradition of Dessehra (a Hindu festival that celebrates the victory of good over evil) also closely resembles a real life Game of Thrones. Nayyar teaches himself guitar by learning Poison's seminal hair-rock hit "Every Rose Has Its Thorn," ultimately parlaying his talents into a two-man emo band called the Prince and the Pauper (he's the Prince). They play their first gig at the Java Bean--a gig you can reenact by following the lyrics included to the Prince and the Pauper original "So I'm Lonely Again," (sample lyric: "I note I was barely breathing / Did you feel the same?"). As far as his first big break as an actor goes, it was for the play Huck and Holden, for which he auditioned not on a stage or via video, but in a New York City Apple Store, via iChat with the play's L.A.-based director. Nayyar insists on the spelling aeroplane; he is addicted to mints, estimating he's consumed over 19,000 Altoids since The Big Bang Theory began taping; and his wife, Neha, is an actual beauty queen. (Their meeting is touchingly described in the chapter "And Then I Fell in Love" and their "Big Fat Indian Wedding" recollected in a dizzying blur of one thousand guests, a band of friendly neighborhood eunuchs, Prince of Persia outfits, and time honored traditions, including riding a bejeweled horse into the wedding ceremony.) YES, MY ACCENT IS REAL will embolden anyone whose name has been mispronounced countless times, whose background has been constantly misunderstood, or whose social awkwardness has been a consistent barrier. The ultimate achievement of the book is in collecting all of these happenings, which add up to the meaningful life that Nayyar enjoys today--convincing us to believe in a sliver of advice from his father: "If it happens, good. If it doesn't happen, very good." Accidental miracles and relationships forged in inexplicable circumstances give Nayyar's life story its own patently believable Big Bang Theory. You will be inspired, amused, and mildly appalled--at least as much as you are when you watch Raj fumbling through life as an astrophysicist on TV. And at the book's completion, you'll be compelled to follow a bit of Nayyar's own advice, jotted on a reliable aeroplane cocktail napkin: "Keep pushing forward. You're stronger and more resilient than you can imagine. We are incredible creatures." Kunal Nayyar was born in London, England and raised in New Dehli, India. He first came to the United States in 1999 to pursue a Bachelor of Science in Business at the University of Portland (Oregon) and he received an MFA in Acting from Temple University. He has been part of The Big Bang Theory ensemble since it debuted in 2007. A ratings powerhouse in its sixth season (2012-13), The Big Bang Theory was the #1 most viewed scripted show in the 18-49 demographic on television and the ratings leader in all of syndicated programming. He lives in Los Angeles with his wife, Neha, who was named Miss India in 2006.